Son of Frederick, a Watch Guilder, and Emily Bennett. Born 12/02/1891 at 26 court, 4 house, Spon Street. Resided at 36 Sherbourne Street. Water Meter fitter. Enlisted April 1915. Died of injuries received in an accident at Colchester 01/02/1916. Buried London Road Cemetery, Coventry. The son of Arthur & Fanny Giles of 32 Alma Street. Born 12/09/1895 at Bewdley. Resided at 32 Alma Street. Plumber. Enlisted in 1914. Gassed at Loos, died in Coventry 15/02/1918. Buried London Road Cemetery, Coventry. His older brother Joseph James, a Lance Corporal in the 1st Battalion Border Regiment, was killed in action at Gallipoli 11/06/1915. 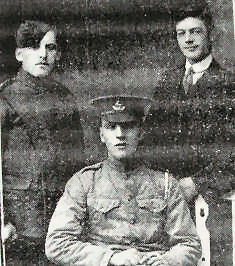 The son of Daniel and Emma Whitehouse, Daniel (pictured below, seated) was born on the 18/04/1894 in St Michael’s parish Coventry. He was married to Louie and they resided at Stockton Road. Daniel worked as a Mechanic and enlisted in September 1914. After he was wounded at the Dardanelles he returned home and died later at Coventry on 31/10/1918, aged 24. Buried London Road Cemetery, Coventry.